How Do I Benefit from Body Brushing? There are a number of ways to make your skin look good, but you may have to cough up a lot of money to take advantage of certain products. If you're looking for an effective yet economical way to bring out the best of your skin, try body brushing. The good thing is that body brushing is equally beneficial for everyone, including babies and people with sensitive skin. You just have to take some care when selecting the brush. Here's more about the benefits of dry brushing and the right way to make it work in your favor. You can use dry skin brushing to remove dead skin layers, which in turn will improve the overall texture of your skin. It is important to shed dead skin cells regularly or else they will accumulate on your skin and lead to issues like psoriasis, eczema, and dandruff. Stick to dry body brushing can strengthen your immune system. It helps stimulate the lymph vessels and drain toxic mucoid matter to purify your body. Brushing will help clear infections, accelerate the healing process and is extremely beneficial during treatments for chronic illnesses and cancer as well. Your body will perform at its very best when your oil glands are stimulated, and that's what you can achieve through regular dry brushing. Under normal circumstances, your skin will play a huge role in eliminating toxins. Improper skin maintenance will overload your kidneys to perform all the detoxification. Body brushing keeps your skin clean and help it perform its job perfectly. One of many benefits of body brushing is that it helps tone your muscles by stimulating your nerve endings. It also works amazingly well to mobilize fat and keep you fit. With body brushing, you can improve circulation to your skin and encourage your body to get rid of metabolic wastes. With better blood flow to your skin, you will feel invigorated and energized. The process also helps prevent varicose veins. 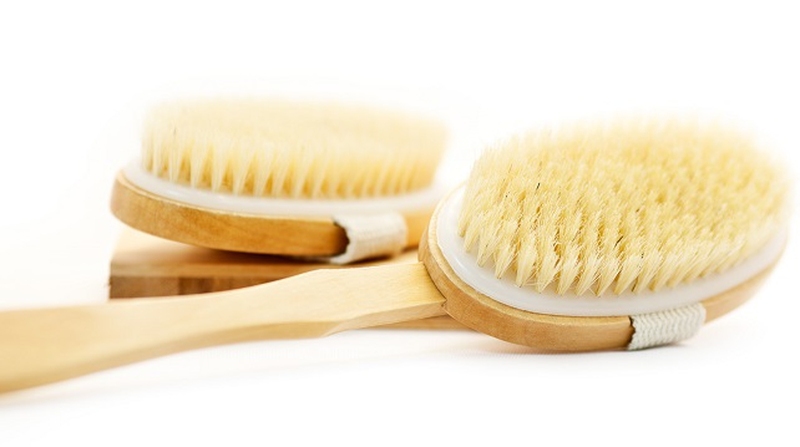 Regular dry brushing will help your skin breathe by eliminating clogged pores. The pores will then be in a better position to absorb nutrients as well and you will enjoy better overall body health. Body brushing will help reduce cellulite because it helps get rid of toxins trapped in the subcutaneous layer beneath your skin that causes cellulite. Dry brushing is probably the cheapest way to get rid of cellulite and improves the appearance of your skin. If you're new to body brushing, here's how you can handle the whole thing with utmost ease. The first thing is to get you a right brush. Pick the one with all-natural bristle. Vegetable-derived bristles are even better. It should have a detachable handle or a handle long enough to all areas of your body. Invest in a facial brush if you want to use a brush on your face as well. Be sure to brush before you take a bath. It's dry brushing for a reason. Be sure to brush from the bottom up in order to support the pathway of your lymph. Be sure to use long, sweeping strokes starting from your feet and moving towards the heart. Start from your feet and move up the legs, and then the hands tight up to your shoulders. Be sure to brush your torso back towards your heart and brush your stomach maintaining a counter-clockwise motion. Brush toward the collarbones when brushing the neck. Never move brush away from your heart or it may exert extra pressure on the valves in your veins and lymph vessels. Always use strokes in a single direction. Don't be too harsh, and apply light pressure only where your skin is relatively thinner. Don't use brushing on sensitive areas, bruises, rashes, cuts, etc. Be sure to use lighter strokes and don't push your body if you're pregnant. Stop if something doesn't feel right. Be sure to take a bath after dry brushing to ensure there are not dead skin cells left on the skin. You can use an awakening body wash such as peppermint for better effects – it's intoxicating and invigorating as well. Make use of a cellulite body cream after shower. Dry brushing increases the blood flow and opens up pores, so it is usually the best time to use any skin care product. Be sure to get a baby hairbrush to use it on your baby's skin. Make sure the bristles are gentle enough for your baby's skin. Be sure to tap or shake your brush after use to eliminate dead skin. Don't share brushes with other people. Don't let your brush get wet and keep it in a dry place always. Wash your brush once in a while (once a week is good). Use soapy water to wash it and place it in a sunny area to dry.